Every few years, there are calls to retire the American penny (as cumbersome and too expensive to produce), and rebuttals to preserve it (for posterity and price stability). I don't know how or when this question will be answered. Personally, I would not miss the gobs of metal in my pockets, but I would miss the lettering. And the numbering. They're easy to miss when you're scrambling for change at a shop counter. Or you might just leave them in a dish there, if you can't be bothered to cart them around. 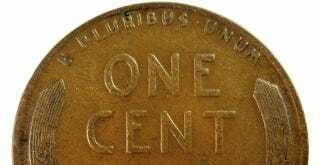 But the lowly penny, more clinically known as the "one-cent piece", has a history of lettering all to itself. Coins are normally a job for sculptors, and President Theodore Roosevelt chose Victor David Brenner to design a new penny to celebrate the centennial of Lincoln's birth in 1909. The new coin broke from the tradition of allegorical figures, and depicted a specific person for the first time. Such practice had been explicitly avoided since independence, because many felt it tasted too much like the monarchy they had left behind. It seemed that Lincoln's hundredth birthday was the right time to drop the prohibition, and now we find it hard to imagine American currency without presidents. The design process was marred by tension between Brenner and US Mint Engraver Charles Barber, who had designed earlier coins and likely felt he should have received this commission himself. While proofing the design, Barber and Mint Director Frank Leach shifted Lincoln's portrait towards the center of the coin, where the detail could be best rendered in striking. Troubled by the blank space above Lincoln's head, they decided to add "IN GOD WE TRUST" along the top edge. This motto had appeared on U.S. coins for years, so Brenner could not have been surprised at its inclusion, but I can't imagine he was happy about the tampering. The lettering records the dissonance between the artist and his client. The "1909" figures are calmly rendered, and suggest a tool driven through clay or plaster. With awkward shapes and erratic spacing, the motto looks more like a part number brusquely stamped in. The motto would not get fixed for sixty years, after 55 billion coins had been produced. The reverse of Brenner's design is a beautifully balanced mass of lettering framed by sheaves of wheat, epic and quaint in the same breath. It is the pocket-sized monument that coins are meant to be, speaking for the ages from the vantage of 1909. The craft afforded here also belies the fact that this is the country's smallest denomination. Brenner's wheat sheaf design would also be the last time that lettering featured so prominently in U.S. coinage. It remained for fifty years, until Frank Gasparro's rendition of the Lincoln memorial replaced it in 1959, to mark the sesquicentennial of Lincoln's birth. The figure '7' had a similarly haphazard treatment. It appeared in a different form every ten years between 1917 and 1967, before settling down with a descending curve in 1974. To accommodate the escalating price of copper, the Mint changed the penny's composition in 1983, from 95 percent copper to almost entirely zinc, with a thin coat of copper to retain the traditional color. The change in material also reduced the coin's weight by 20 percent, inadvertently dramatizing its dwindling value. At about the same time, the dies were made shallower to reduce wear, flattening the coin overall. The figures became lighter and more monotone, losing the modeled quality of sculpture. The trend towards flatter surfaces has gradually continued since then, and now a penny feels more like a laser print than the tiny sculpture it actually is. Around 480 billion pennies have been minted since 1909, and every one of them is still "live" currency. By some estimates, two hundred million Lincoln Wheat pennies are still in circulation, so it's not uncommon to find one in your pocket — I collected about thirty over six months of everyday transactions. So if you haven't already, check your pockets and handbags for some overlooked history. Tobias Frere-Jones is one of the world's leading typeface designers. He has created some of the world's most widely used typefaces.